Like many AT thru hikers I found myself wondering just what exactly was on the other side of that sign at Maine Junction just behind the Inn at Long Trail. Vermont’s Long Trail is almost like the stuff of legend. We hear stories of the deep mud, torrential rain, and a trail harder than what we hiked in the White Mountains or in Southern Maine. As far as trail legend goes, I can definitely say the Long Trail lived up to the expectations. The last time my knees hurt this much was after hiking 2,184 miles in 2012 – not after only three weeks and one state! Getting back on trail in Williamstown was entirely surreal to us. On my AT hike I never thought I would be back in this area again, yet here I was for the second time in less than a year – this time with a full pack on my back headed for Vermont. After being on remote trails most of the summer, the shear number of people we met the first few hours hiking was very exciting to us. During our 2012 thru hike this section of trail was mostly foggy and cloudy due to rain, so it was exciting to see things again with the sun shining. We had beautiful views on Glastenbury Mountain and Stratton on our third day, which more than made up for the fact we had already hiked this section of trail before. Although we had rain at night a few times, the trail was in really good shape! We came through just a few months post Hurricane Irene storm damage last time, so seeing how the trail had recovered with all the work put in by the GMC was very eye opening. 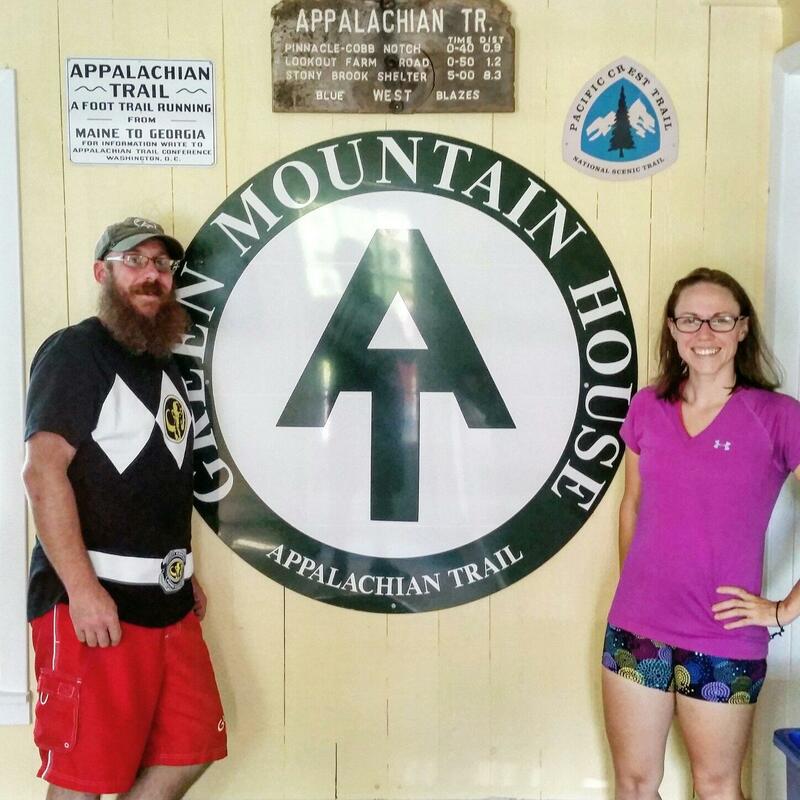 We were also able to stay at Green Mountain House Hostel this time, which has elevated it’s way to the top of my hostel list for the Appalachian Trail. We were greeted again by beautiful views on Bromley and on Killington – we even climbed up the 0.2-mile blue blazed trail to the top for a second time just because the sky was so blue that morning. 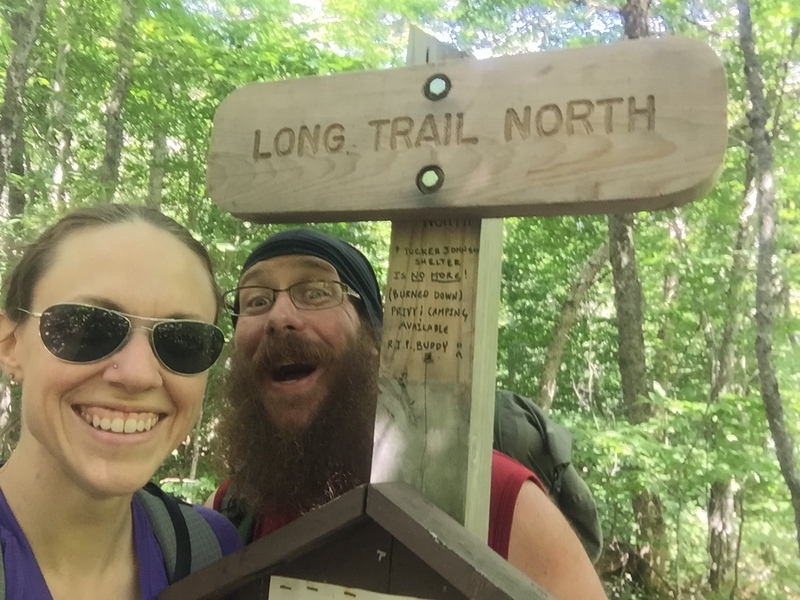 We ended week one by making it to Inn at Long Trail. We were excited to be entering unfamiliar territory after leaving the Inn at Long Trail. We did bonus miles, hiking up the historic route of the Long Trail and hiking up to Deer Leap Overlook, AKA the big giant rock hanging over the Inn. When we headed north from Maine Junction the only thing we knew we could expect was for our mileage to drop and our pace to slow. The first few days headed north were a little tougher than the 20 mile days we were pulling on the AT part of the Long Trail, but not too bad. After being out a few more days, however, the climbs got steeper. The trail in this part of Vermont only seems to know one mantra – straight up and straight down! We were starting to hike over a lot of ski slopes, which was honestly kind of sad to see and was unexpected. The trail didn’t truly get difficult until a few days in to our first week, when we had to do rock slab hiking up Mt. Abraham to a foggy and viewless alpine summit. Also, at the end of this day, we climbed down Appalachian Gap on wet metal rungs and ladders, much like you do climbing down Mt. Moosilauke in The White Mountains. Our next day, we had a 5-mile stretch that took us four hours to hike – up and over Burnt Rock Mountain with the help of ropes tied to trees and wet metal ladders down the aptly named Ladder Ravine. Climbing up Camel’s Hump, our second of three alpine summits, found us looking to take the bad weather trail around the peak due to thunder and rain. Let me tell you that the bad weather trail was in no way any easier in terms of wet and exposed rock! The day after this we went over our third and final alpine summit, the highest peak in Vermont, Mt. Mansfield. While the weather was much better, the trail was no easier! Due to the recent rains the famous mud from Vermont made an abundant appearance. Climbing up Mt. Mansfield to The Forehead found us once again climbing ladder after ladder, sometimes climbing one just to get to another! The final week of our Long Trail hike took us even further north. I’d had an idea of what rural Vermont would look like in my head and was definitely not expecting what we saw! At Sterling Pond we had planned an afternoon of leisure with some other thru hikers and showed up to find that at 11:30 on a Monday morning the place was packed! We counted more than 30 people crammed on the small beach of this mountain pond near, you guessed it, some ski slopes. After talking to one of the GMC caretakers we were given directions to a more private and quiet area before heading up and over yet another ski slope to our shelter. Despite the ski slopes and throngs of tourists early in the week, NoKey still continued to get beat up by the Long Trail, taking a bad spill on wet rocks nearly every day. Once we passed the town of Johnson, it was mostly thru hikers from here to Journey’s End. The weather had turned incredibly warm for our last week on the trail with temperatures in the 90s and the sun blazing – hard for hiking, but great for drying out the muddy trails of Vermont. We started lovingly referring to the mud as being the icing on the cake of the Long Trail, as the consistency was much like thick cake icing and no longer made us sink up to our calf muscles! Proving nothing lasts forever, our second-to-last night on the trail provided us with a steady downpour for 16 hours giving us muddy and wet conditions for our last two days. When we finally made it to Journey’s End, our adventure really began, as we had no plans for how to get back to our car in Rutland. Six hitches and 7 hours later we had made it back to our car to camp at the Inn at Long Trail. The Long Trail was the crown jewel on our summer of hiking. While NoKey loved it, I was much slower to come around. 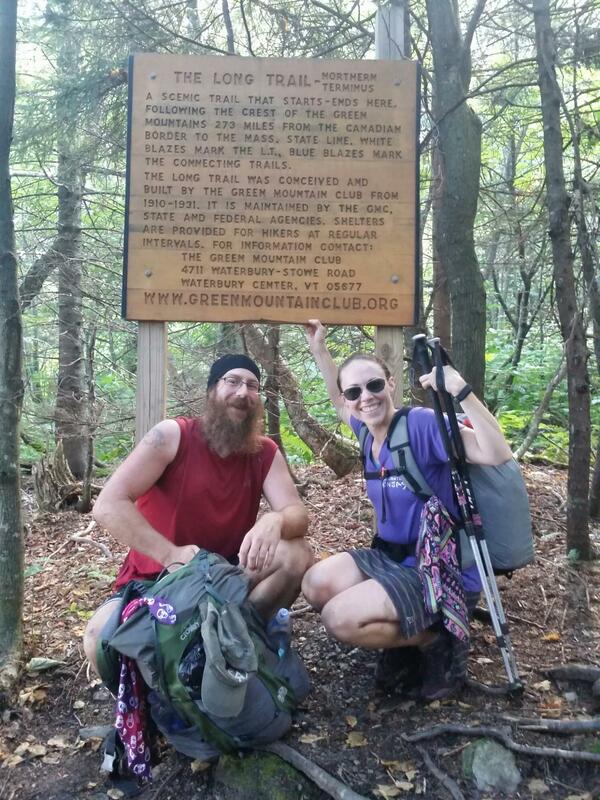 While we were hiking I cursed the trail and Vermont and the Green Mountain Club for the trail conditions and the pain I felt throughout my body. However, just like after the AT, I am gradually learning to love the Long Trail. While even a month later my knees are still sore, I find myself fondly forgetting the pain and suffering I felt while hiking – only remembering the good moments and the friends we made. The social structure on the Long Trail is very similar to what we felt on the Appalachian Trail in 2012, which was so very different from the Finger Lakes Trail and the Benton MacKaye Trail. If you’re looking for a good challenge, I highly recommend putting a thru hike of the Long Trail on your list! The monument at Journey’s End – I’m on the Canadian side of the border! If you want to see more photos of our thru hike, please check out my Facebook page. If you’re looking for more detailed descriptions of the day-to-day hiking from the Long Trail, my blog has a breakdown of every day with some photos over at SprinklesHikes.com. If you have any questions about the Long Trail or just want to talk about your experience hiking it, please leave me a comment below! Sprinkles is a 2012 AT thru hiker, a Smoky Mountain 900-miler, and a thru hiker of both the Benton MacKaye Trail and the Long Trail. 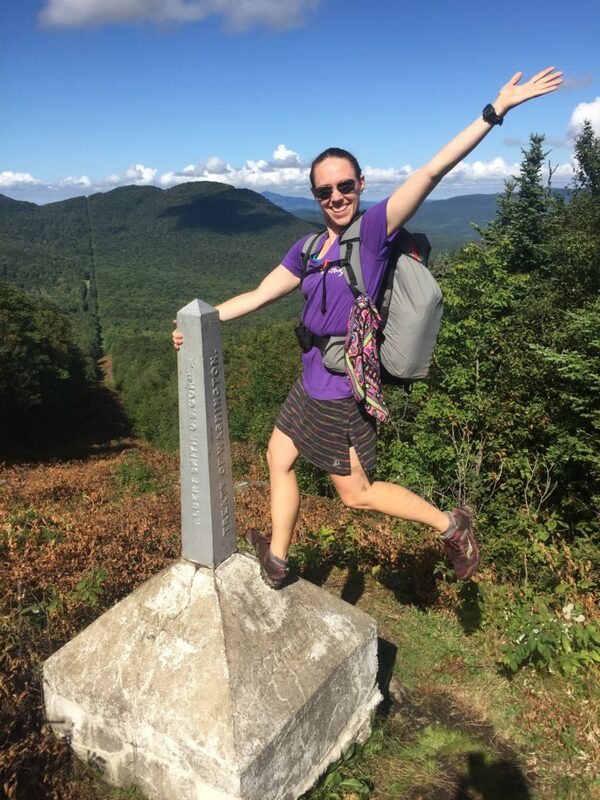 She is currently a backpacking guide in the Great Smoky Mountains for a local outfitter and is constantly dreaming of getting out on her next long-distance hike. You can learn more about Sprinkles from her Instagram and Facebook pages, as well as her personal blog!